M32W wireless Internet of Things module is designed for the easy of programming and installation of IoT projects where a wireless protocol (zigbee, bluetooth, 433Mhz etc) is required. It is a plug-in module for MS14-S and powered by an AVR ATmega32u4 microcontroller. The M32W has a standard XBEE Socket and RFM12B footprint to implement different wireless protocol modules. It also has a breadboard area for easy prototyping. M32W is Arduino Yûn compatible, it communicates with MS14-S CPU via SPI and UART interface and provide the power / GPIOs via the 14 positions screw terminal on MS14-S. M32W can be programmed by the latest Arduino IDE. The board type in Arduino IDE is "Arduino Yun". With the combination of MS14-S, M32W and Arduino Yun software, users can install powerful Internet of Things projects that interface with i.e. XBee or RFM12B wireless sensors in an easy and quick way. Bridge various wireless protocols such as zigbee, bluetooth, NFC into WiFi IP network. M32W has a standard XBee Socket. Any module compatible with this socket can be used directly in M32W. RFM12B footprint for HopeRF RFM12B module or RFM69CW/HCW 433/868/915 Radio module. A on-board prototyping area with power and Arduino pinout for easy prototyping. When the M32W is used with MS14-S, the user can define the screw terminal connections by using the prototype area as shown above. M32W has a micro USB connector and can act as standard USB COM device. 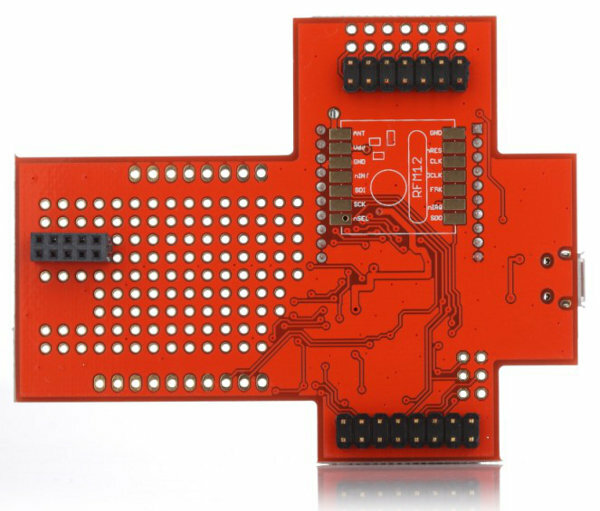 This USB connection can be used to upgrade sketch or debug the software via serial monitor on Arduino IDE.